Cable companies want to slow down (and break!) your favorite sites, for profit. To fight back, let's cover the web with symbolic "loading" icons, to remind everyone what an Internet without net neutrality would look like, and drive record numbers of emails and calls to lawmakers. Look what we just did together. Are you in? Fight for the Future and Demand Progress will send you developer updates. Thanks! 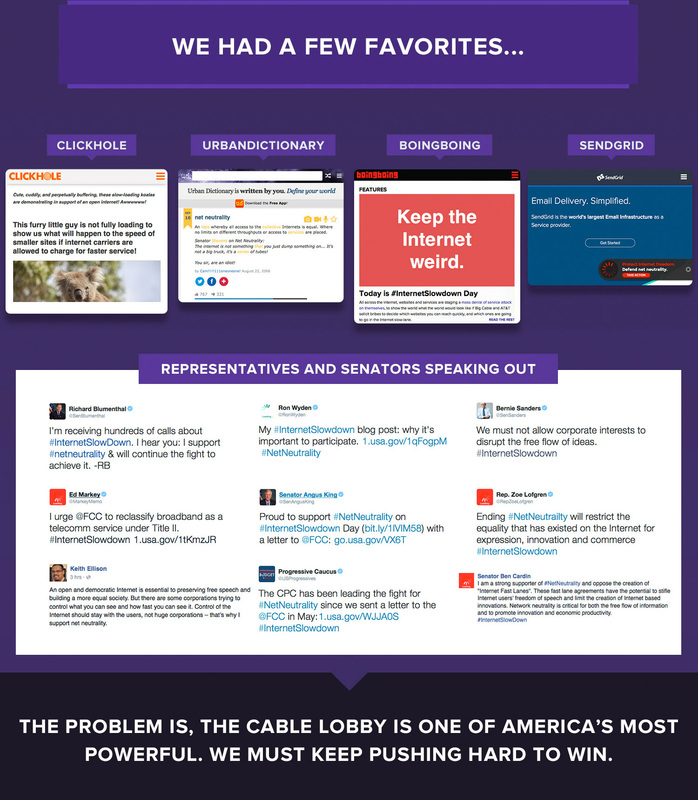 We'll send you #InternetSlowdown updates! On September 10th, sites across the web will display an alert with a symbolic "loading" symbol (the proverbial “spinning wheel of death”) and promote a call to action for users to push comments to the FCC, Congress, and the White House, in support of an Internet Freedom Letter circulated by Senator Angus King and others. Note: none of these tools actually slow your site down; they tell your visitors about the issue and ask them to contact lawmakers. Is social media your biggest audience? Change your avatar to a spinning wheel of death. Share these images on Facebook. Or tweet these on Twitter. Be creative! Grab peoples' attention with a loading symbol, and link to tools for emailing and calling lawmakers (e.g. 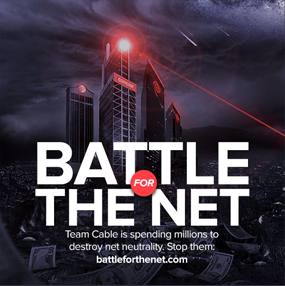 battleforthenet.com). Whatever you decide, tell us you're participating, announce it publicly, and commit to getting *one* person or company with a *bigger* reach than you to join in as well. Got a question? Contact us. These stats are only as of the time of posting, and are still growing a lot! Please also note, these stats don't include hundreds of thousands of actions taken on other sites. There’s a bunch of different ways for sites to participate. The best way? Run this modal. The runner up? This alert. You can also change your site’s logo (or one of its letters) to a spinning wheel of death or embed this action tool in a high traffic page. We’ve also got widgets for Wordpress.com, and Wordpress (self hosted). NOTE: none of these tools will slow down your site; they just show a symbolic loading symbol. 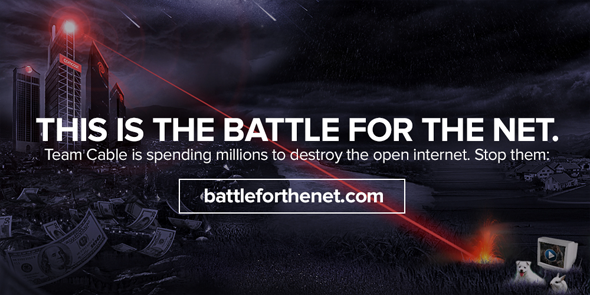 By default they link to battleforthenet.com, but you can change the URL if you like. To show the modal on September 10th, paste this code into the <HEAD> of your site. More info. Paste this code into the <HEAD> of your site. More info. If you have a mobile app, can you send just one push notification to your users? 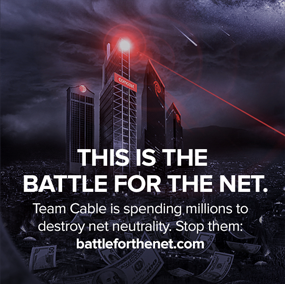 Tell them that ISPs are threatening to slow your app, and link them to https://www.battleforthenet.com. Protest Internet slow lanes on Twitter, by changing your profile photo to the dreaded spinning wheel of death (in your favorite color). Then you can try out these tweets. 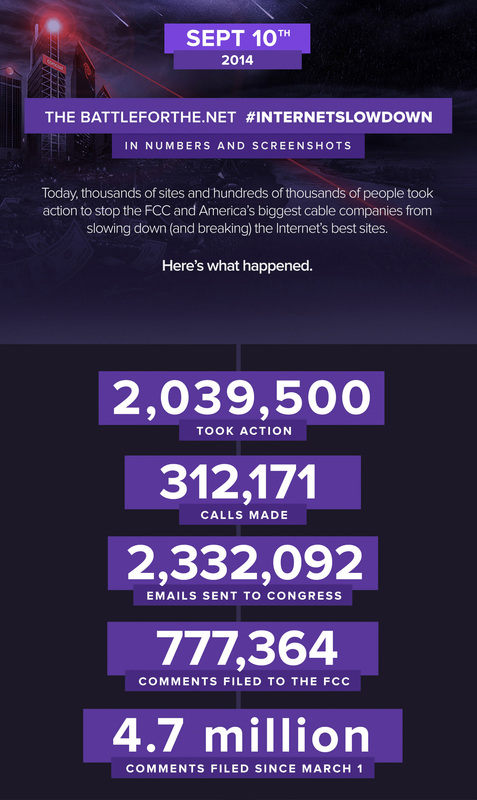 We need as many people as possible to see this site, write Congress and the FCC, and keep fighting until we win. Can you post these images everywhere? You can share these images too. This is the time to go big, visible, and strong - that's the only way we can actually win this fight. We all need to get as many people in our respective audiences motivated to do something. We can make this epic, but only if you help. We need companies to be frontrunners, leaders, and heroes on this, that’s the key ingredient to raising the bar and making sure everyone goes big. We realize it's a big ask, but this is the kind of bad internet legislation that comes along (or gets this close to passing) once a decade or so. If it passes we'll be kicking ourselves for decades—every time a favorite site gets relegated to the slow lane, and every time we have to rework or abandon a project because of the uncertain costs paid prioritization creates. Doing the most we can right now seems like the only rational step.